Cisco 110 Series Fast Ethernet Unmanaged Switches deliver powerful network performance and flexibility for small business networks, without the complexity, with no installation software and nothing to configure. Build a fast, reliable network with these entry-level, low-cost, reliable networking solutions that provide plug-and-play connectivity. The SF110D-08 Unmanaged Desktop Switches deliver Fast Ethernet switching with key features like energy efficiency, traffic prioritisation, and network diagnostics for seamless integration into the rest of the network. The SF110D-08 Cisco Small Business 110 Series Unmanaged Switches delivers a wire-speed Fast Ethernet connectivity to connect your small business office. The 8 Port desktop model offers plug-and-play basic Layer 2 connectivity. That includes quality of service (QoS), cable diagnostics, and loop detection - all in a switch that you can set up by yourself in just minutes. Build a fast, reliable network with these entry-level, low-cost, reliable networking solutions that provide plug-and-play connectivity. The Cisco SF110D-08HP Unmanaged Switches deliver Fast Ethernet switching with key features like Power over Ethernet (PoE), energy efficiency, traffic prioritisation, and network diagnostics for seamless integration into the rest of the network. 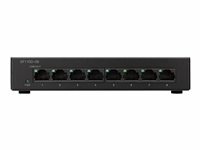 The SF110D-08HP Cisco Small Business 110 Series Unmanaged Switches deliver wire-speed Fast Ethernet connectivity to connect your small business office. The 8 Port switches offer plug-and-play basic Layer 2 connectivity. That includes low-cost PoE, quality of service (QoS), cable diagnostics, and loop detection - all in a switch that you can set up by yourself in just minutes. PoE provides power budget of 32 Watts to IP phones, access points, and other devices. Build a fast, reliable network with these entry-level, low-cost, reliable networking solutions that provide plug-and-play connectivity. The SF110D-16 Unmanaged Desktop Switches deliver Fast Ethernet switching with key features like energy efficiency, traffic prioritisation, and network diagnostics for seamless integration into the rest of the network. The SF110D-16 Cisco Small Business 110 Series Unmanaged Switches delivers a wire-speed Fast Ethernet connectivity to connect your small business office. The 16 Port desktop model offers plug-and-play basic Layer 2 connectivity. That includes quality of service (QoS), cable diagnostics, and loop detection - all in a switch that you can set up by yourself in just minutes. Build a fast, reliable network with these entry-level, low-cost, reliable networking solutions that provide plug-and-play connectivity. The Cisco SF110-16 Unmanaged Rackmount Switches deliver Fast Ethernet switching with key features like energy efficiency, traffic prioritisation, and network diagnostics for seamless integration into the rest of the network. The SF110-16 Cisco Small Business 110 Series Unmanaged Switches delivers a wire-speed Fast Ethernet connectivity to connect your small business office. The 16 Port rackmount model offers plug-and-play basic Layer 2 connectivity. That includes quality of service (QoS), cable diagnostics, and loop detection - all in a switch that you can set up by yourself in just minutes. Build a fast, reliable network with these entry-level, low-cost, reliable networking solutions that provide plug-and-play connectivity. The Cisco SF110D-16HP Unmanaged Switches deliver Fast Ethernet switching with key features like Power over Ethernet (PoE), energy efficiency, traffic prioritisation, and network diagnostics for seamless integration into the rest of the network. The SF110D-16HP Cisco Small Business 110 Series Unmanaged Switches deliver wire-speed Fast Ethernet connectivity to connect your small business office. 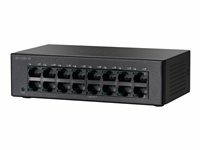 The 16 Port switches offer plug-and-play basic Layer 2 connectivity. That includes low-cost PoE, quality of service (QoS), cable diagnostics, and loop detection - all in a switch that you can set up by yourself in just minutes..
PoE provides a power budget of 64 Watts to IP phones, access points, and other devices. Build a fast, reliable network with these entry-level, low-cost, reliable networking solutions that provide plug-and-play connectivity. The Cisco SF110-24 Unmanaged Rackmount Switches deliver Fast Ethernet switching with key features like energy efficiency, traffic prioritisation, and network diagnostics for seamless integration into the rest of the network. The SF110-24 Cisco Small Business 110 Series Unmanaged Switches delivers a wire-speed Fast Ethernet connectivity to connect your small business office. The 24 Port rackmount model offers plug-and-play basic Layer 2 connectivity. That includes quality of service (QoS), cable diagnostics, and loop detection - all in a switch that you can set up by yourself in just minutes. Build a fast, reliable network with these entry-level, low-cost, reliable networking solutions that provide plug-and-play connectivity. The Cisco SF112-24 Unmanaged Rackmount Switches deliver Fast Ethernet switching with key features like energy efficiency, traffic prioritisation, and network diagnostics for seamless integration into the rest of the network. The SF112-24 Cisco Small Business 110 Series Unmanaged Switches delivers a wire-speed Fast Ethernet connectivity to connect your small business office. The 24 Port rackmount model offers plug-and-play basic Layer 2 connectivity. That includes quality of service (QoS), cable diagnostics, and loop detection - all in a switch that you can set up by yourself in just minutes.